Brave was released on blu-ray in 2012. Jeff and George originally shared this review on Communicore Weekly (the Greatest Online Show™). We both saw Brave in the theater and discussed the film in an episode of Communicore Weekly. While we both really enjoyed the film, we walked away thinking that something was missing. Is the film worth picking up on Blu-ray? George: I saw Brave in the theater with my wife and kids. We all enjoyed the film, but the boys (13 and 8, at the time) didn’t seem as impressed as I was. Technically, the film was gorgeous, but it seemed to be missing something. When the review copy hit the door, we watched it as a family over two nights. The 13 year-old seemed to enjoy it a lot more than my younger son, but we all seemed to laugh and enjoy more at home. Jeff: Like George said, when I first saw Brave, I felt it was missing a little something. I didn’t hate it by any means, but I didn’t fall in love with it either, like I do with most Pixar films. However, unlike George and his family, watching it this second time at home, I seemed to like it even less. Visually, the film is stunning, but I was left feeling like there was an emotional impact missing from the heart of the film. George: As much as I love the movie theater experience, with the advent of Blu-ray, high-definition TV and amazing surround sound, I find I enjoy the home movie experience more than the theater. 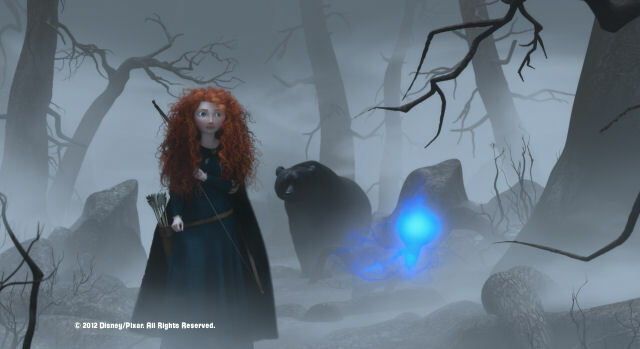 Brave was made for hi-definition; the images are crystal clear and stunning while the audio is superb. I noticed the background music and songs more at home than in the theater. Once again, Disney/Pixar proves that they can cast excellent actors for the voices. I agree with Jeff that the movie is missing some heart, but I think I enjoy the film more because of my own relationship with my teenage son. His hair looks just as crazy at Merida’s. Jeff: I’m sure he’d love you comparing his hair to Merida’s! Speaking of, on the flip side, Alex, my nine year old, seemed less into the film than I did. His reaction was a resounding “Meh, it was alright.” He also agrees that the visuals were stunning, but his favorite part was when “that bear started tearing it up.” Straight from the mouths of babes, folks. George: The blu-ray combo set is chock full of amazing extras about the creation of the film. The theatrical short, La Luna is included and it is just as charming as in the theaters. The new short, the Legend of Mor’du is presented and it is a fantastic addition to the film and the Pixar repertoire. I was blown away by the number of the specials in this package. As expected, there are a lot of bonus features about the making of the film. 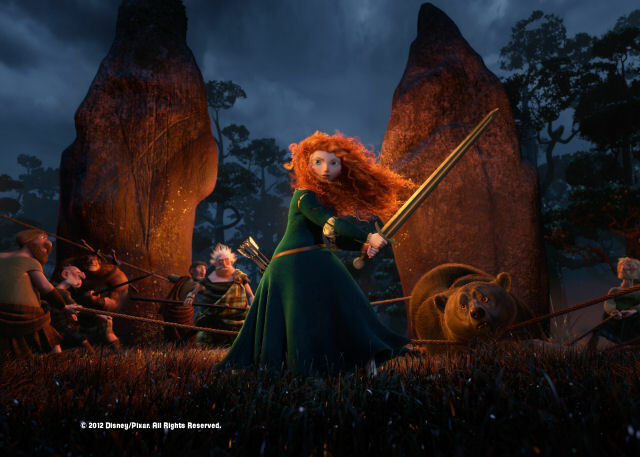 With a technical achievement like Merida’s hair, you can imagine the behind-the-scenes segments would be technical but they’re presented in a style that kids and adults will enjoy. My youngest even spent time watching them with me. My guess is that there are over 3-4 hours of extras. The extras really do add to the overall viewing experience. What did you think about Brave? How does this film fit into the Pixar pantheon?